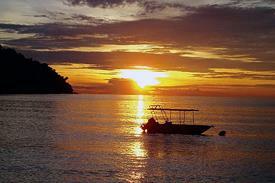 Lumut is a coastal town situated in the Manjung District of Perak state, Malaysia. It was formerly made famous for being a small fishing town, but has currently evolved into a modernized town and is most well-known for being the gateway to Pangkor Island. Lumut is also home to the biggest naval shipbuilder site in Malaysia, Boustead Naval Shipyard. One of the most preferred way of traveling to this small but beautiful town is by taking a bus to Lumut. This option is the most popular amongst the foreign tourists and even the locals. Since it is a coastal city, it only makes sense that the bus terminal would be located near the coast, with the main bus terminal being Lumut Bus Terminal near the Lumut Waterfront Jetty. 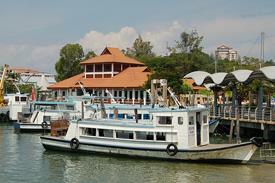 The close proximity of the bus terminal and the jetty allows passengers coming from the bus to Lumut to make their way to Pangkor Island, a naturally beautiful island that has so much to offer. Apart from the infamous Suspension Bridge, Pangkor Island has one of the most beautiful beaches in Malaysia and offers a lot of authentically tasty food and unique items and handicrafts. Pick-Up and Drop Off Points for the Bus to Lumut. Since Lumut is a considerably small town, it currently only has one main bus terminal, which is the Lumut Bus Terminal located near the Jalan Raja Musa and within close proximity with the Lumut Waterfront Jetty. Due to this, most of the bus to Lumut will make pick-up and drop offs at this particular location. Pangkor Island, Rahmat Maritime Museum, Teluk Nipah, Sembilan Islands, Paya Bakau Park, Teluk Batik, Pasir Panjang Turtle Hatchery, Mangrove Swamp Park, Sitiawan. Book your tickets for the bus to Lumut today!